BookCon 2017: Happy 20th Birthday, Captain Underpants! 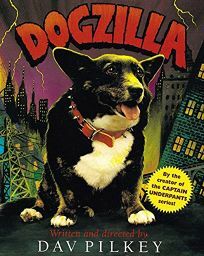 From the creator of Captain Underpants comes the hilarious Dogzilla and Kat Kong by Dav Pilkey, first published in 1993 and featuring a wacky mix of animal photos, art and a deadpan Sam Spade-style narrative. The first title begins, ""It was summertime in the city of Mousopolis,"" as the dreadful Dogzilla terrorizes the mice with her horrible dog breath. In the second, Doctor Varmint and Rosie Rodent capture the mighty Kat Kong and bring him to Mousopolis, where he breaks free and tears through the streets.